Beauty is in the eye of the beholder. It is possible to look at a pile of paint tints, varying colors, arrange them in such a pattern that they become more than just colors. They can take on the ability to become more than their component parts in your mind. Because of the bulky texture of some of the piles you can see that I am trying to pull a fast one. These are not tints, but all of the ingredients required to produce Campbell’s Chunky Chicken Soup. There are a couple of real ones in there. 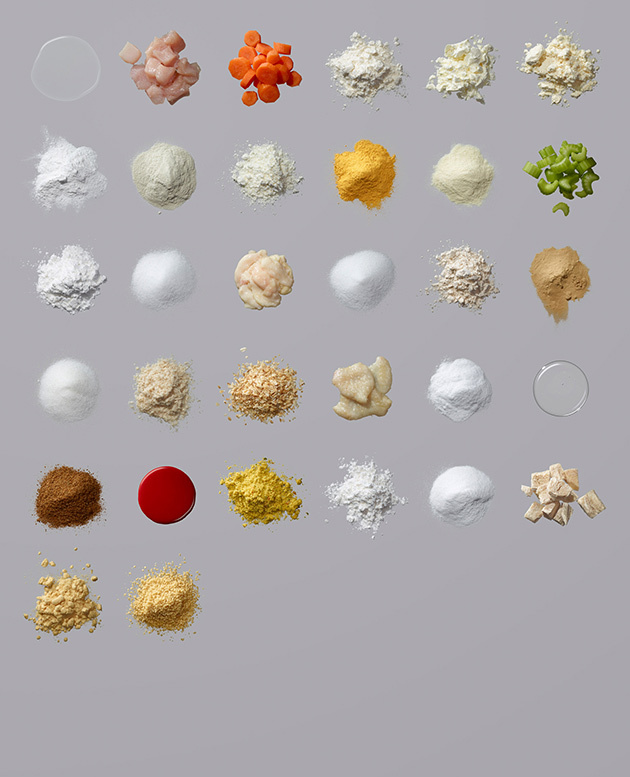 The photo above is from a new book about to be released which shows the ingredients in this way for 25 different foods, “Ingredients: A Visual Exploration Of 75 Additives & 25 Food Products” by Dwight Eschliman and Steve Ettlinger. There is an article in Mother Jones about it this morning. When I look at this photo though, I do not see a beautiful sight. What I see is how much trouble that the food industry goes through to make food last almost forever from the long trip from the factory to your table. In the name of profit they are working as hard as is humanly possible to create new ingredients that solve age-old food problems. Ingredients to make it creamier. Ingredients to make it flow. Ingredients to make the product uniform. Calling dough conditioners “chemicals” isn’t entirely accurate, because they start with a fat, such as soybean oil, beef tallow, or palm oil. After that, you need a heavy-duty floodlight to guide your way down the industrial rabbit hole. Here’s a quick glimpse: To create sodium stearoyl lactylate, the fat is first sheared into its component fatty acids in a process known as thermal cracking, something commonly employed in petroleum refining. The resulting stearic acid or palmitic acid is then combined with heat, lactic acid, and sodium. That gives you the sodium stearoyl part. To get lactylate, cornstarch is treated with enzymes to yield dextrose, which is then fermented to produce lactic acid. Monoglycerides and diglycerides come from applying an alcohol and an acid to glycerin, a derivative of soybean or palm oil. Further processing of these compounds with tartaric acid, a naturally occurring chemical found in wine though derived synthetically, yields DATEM. Sodium stearoyl lactylate and mono- and diglycerides are not exclusive to bread. Warner, Melanie (2013-02-26). Pandora’s Lunchbox: How Processed Food Took Over the American Meal (pp. 102-103). Scribner. Kindle Edition. Each and every ingredient is the equivalent of a pharmaceutical. In the case of a new drug, not a new class of drugs, but a newly formulated drug, the approval process is well known. The drug maker puts together an animal trial, then a human trial. Side effects are carefully monitored, cataloged, and listed on the package and during the TV commercial. We all laugh at the horrible things that MAY go wrong as they list them for a sleep aid or some other drug on TV, as they are required to do. In the case of the food industry, though, it’s not so cut and dried. The FDA does not require such rigorous testing. The FDA is the government agency responsible for overseeing the safety of all our food except fresh meat (that falls to the USDA). It’s a monumental responsibility, and the agency often seeks to convey the impression that the large number of materials going into our food supply are under close watch. “All food additives are carefully regulated by federal authorities and various international organizations to ensure that foods are safe to eat and are accurately labeled,” the FDA states on its Web site. Yet the truth is nowhere near as reassuring. The food industry’s blistering pace of innovation and the force of its lobbying efforts have always overwhelmed those charged with reigning it in. Warner, Melanie (2013-02-26). Pandora’s Lunchbox: How Processed Food Took Over the American Meal (pp. 104-105). Scribner. Kindle Edition. Lately there has been plenty of news regarding the rigor with which the FDA executes its mandate to make sure labels are accurate. Mayonnaise must contain eggs, even if you call it “Mayo” on your label. The FDA is also charged with ‘regulating’ food additives with regard to ‘safe to eat’. How are they doing in that department lately? The FDA finally agrees with the rest of the modern planetary governments that trans fats are dangerous, and cause heart damage. They have agreed to protect our safety, by requiring that they be completely gone from foods three years hence. There are 10,000 modern food additives. Most of them fall under the category of ‘natural flavors’. All of them have been tested for safety by their makers who inform the government that they are safe to eat. Unless there is a problem that crops up later, as in the case of trans fats, for instance, the food additive is assumed to not cause problems. If we aren’t keeling over by the millions, then it must really be ok. If you think I am exaggerating, look at aspartame. Banned in food, approved at industry pleading, now about to be banned again, as food makers abandon it due to bad public opinion of it. The public is leading the regulation. We are not going to get bad artificial ingredients banned in this way, one ingredient at a time, over the years and years it takes to get industry to move due to public opinion. And nowhere on any site will you find mention of what [Pew Charitable Trusts] has estimated are roughly a thousand ghost additives out there on the market. These are ingredients companies have simply declared safe on their own without so much as an e-mail to the FDA. Pew says that the actual number of these additives is unlikely to be less than five hundred but could be several times larger than one thousand. Warner, Melanie (2013-02-26). Pandora’s Lunchbox: How Processed Food Took Over the American Meal (p. 106). Scribner. Kindle Edition. I hope you don’t mind me bolding that last bit. It is entirely possible that the number of ingredients in modern US industrial foods whose safety has been determined by the ingredient maker, whose main aim is to make a profit for the company not produce safe ingredients, is several times larger than 1000. When I look at pretty piles of powders and liquids I do not see beauty. I see a perfectly good explanation why children’s allergies are exploding. I see a possible reason why elementary school kids are blowing up like Thanksgiving day float balloons with obesity. I see an alternative theory for autism that does not involve avoiding vaccines. I see a reason that the state of microbes in the guts of the Western diet is a disaster. We could go on, but the authors would rather you buy their book, which publishes on September 29. Apart from being full of fascinating facts, it may just ease your mind a little bit. We tend to think of food additives as evil, but most of them are fairly benign, and necessary. Unless you plan to make everything from scratch, that is. And we all know that ain’t gonna happen. Most of them are necessary, unless you make your own from scratch. That is what I recommend, quit eating processed foods. The ingredients are potentially unsafe for you and yours. It doesn’t matter how pretty they are, you aren’t going to put them on like makeup, you are going to take them into your body. This entry was posted in Health, Living and tagged FDA, food additives, Food Safety, food science. Bookmark the permalink.